Vintage Japanese Old picture Postcard. Japan. Kotohira-gū Shrine Kotohira-gu Shrine Temple. Sanuki. Garden, Fountain. An Institution for Treasure Kotohira Shrine, Sanuki. 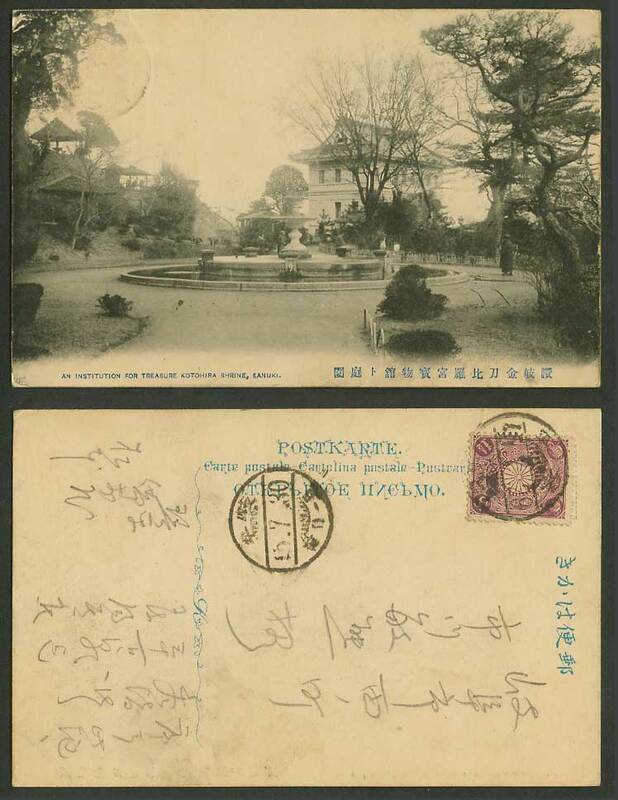 讚岐 金刀比羅宮 寶物館 庭園 Postally Used with 1 1/2s stamp. Background: Kotohira-gū (金刀比羅宮) (also known as Konpira-dai-gongen (金比羅大権現), Konpira-san (こんぴらさん), or Konpira Shrine) is a Shinto shrine in the town of Kotohira in Nakatado District, Kagawa, Japan. This shrine is patron of sea ship transport and sailor.